Discussion in 'Console & PC Gaming' started by GTPNewsWire, Jan 24, 2019. This article was published by Joe Donaldson (@Joey D) on January 24th, 2019 in the Esports category. Can’t wait until people in sponsored tee-shirts at a sporting arena start competing to see how many shipments can be delivered in under an hour for $125,000 in Euro Truck Simulator. AJFast12 and TheNuvolari like this. Why? the FIA GT championchips (for example ) where great to say the least. TheHun99, eran0004 and Snake55wildcat like this. They used to say that those that can't do teach. I guess that will need some updating. Those that can't do simulate. Oyashiro-sama and bloodyboyblue like this. TheConzio98, TheHun99, sundaydriving and 2 others like this. So, what does that say about you since you play GT? RacingPanda and Joey D like this. It goes a bit beyond that. Esports are right up there with autonomous cars and people arguing there are more than two genders as signs of the end of humanity as we know it. Natural selection has been ended artificially and evolution has run its course. We’ll continue to turn a blind eye to overpopulation until the planet takes things into its own hands and takes us down a few pegs with disease and disasters. The rise of Esports are just the equivalent of humanity coughing up a few drops of blood, and we’re reacting to it with a shrug. Natural selection has been ended artificially and evolution has run its course. We’ll continue to turn a blind eye to overpopulation until the planet takes things into its own hands and takes us down a few pegs with disease and disasters. The rise of Esports are just the equivalent of humanity coughing up a few drops of blood, and we’re reacting to it with a shrug. ...The rise of Esports are just the equivalent of humanity coughing up a few drops of blood, and we’re reacting to it with a shrug. I will admit I dont fully understand how these Esports have just completely taken off like they have...But I'm really struggling to understand how you have come to this conclusion ? ImaRobot, Northstar and George Jakob like this. EDK, JackRyanWMU, TheHun99 and 2 others like this. Maybe you’re just old and grumpy. Pretty sure previous generations said the same thing about the internet, the gaming console, the VCR, the TV, the radio, the gramophone, the telephone, the typewriter, the printing press, the pen, the paintbrush and the invention of language. Having watched the FIA GT finals there’s no doubt in my mind about the entertainment value of e-sports. I found it more exciting than 90% of what’s on TV, and I don’t mind watching TV once in a while. RacingPanda and George Jakob like this. Finally an e-sport i can get fully behind. Ah.. just as i thought...besides the "natural selection" etc part which i can't for the life of me take seriously let me asure you that E-sports is not the devil that will destroy our planet. 2. Its not even remotly close to autonomous cars because manual input is required. And 3. E-Sports requier skill both physical and mental unlike argueing about gender because anyone can argue about anything but only some can be fast everywhere. Extemely off topic but I have to say it: the UN has stated that it's unlikely there will ever be 12 billion humans alive at the same time. There's more than enough space and resources for that many people if we play our cards right; and bloody kids playing videogames aren't going to change a single thing. We’ll continue to turn a blind eye to overpopulation until the planet takes things into its own hands and takes us down a few pegs with disease and disasters. The rise of Esports are just the equivalent of humanity coughing up a few drops of blood, and we’re reacting to it with a shrug. TheHun99, wolfsburgraz and George Jakob like this. I mean, it's so dumb that it seems like parody, but there's also actual live events on ESPN that are just as bad/worse so eh. Well then, I didn't think an article about a farming esport would turn into an existential crisis, but here we are. TheConzio98, EDK, EngieDiesel and 2 others like this. What I find most curious of all about your post is that you type it, presumably with a straight face, and allow your signature block to swoop in afterward to tout your virtual racing resume. So, are you completely opposed to Esports, or just the aspect that, in some instances, it's being broadcast and those who are good enough are being compensated? If the latter, I'd assume you're just a tad peeved that some have found a way to be profitable off their talents as opposed to you who seems to be ... well ... doing it for free. Which is fine. But making others out to be the ruin of mankind, well that's just childish. Quit crapping where you play. 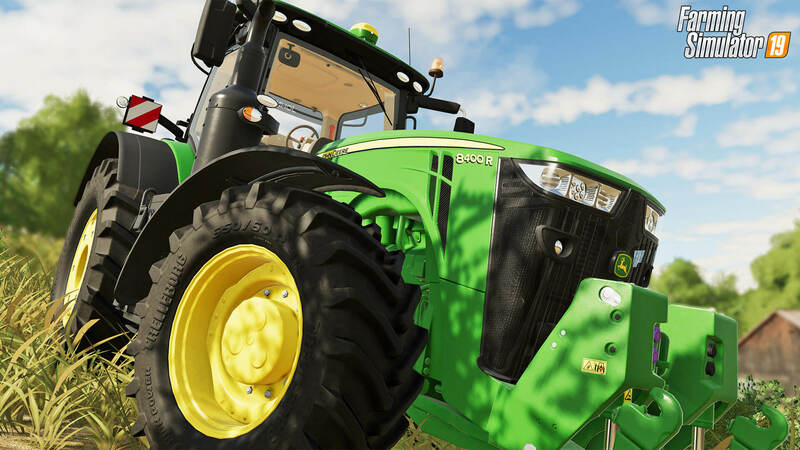 As someone who recently found themselves falling head over heels for Farm Simulator 15, I actually wouldn't mind tuning in to see what a competition is all about. People that are [potentially] bad at real life things but are good at video game things enjoy competing, and people who enjoy video games have fun watching people very good at said video games compete for fame and prizes. Sponsors, television networks and money joined the mix after the potential was seen and the rest is history. In my opinion it's really no different than folks who compete in real sports and their fans that watch them, it's just a different skill set and level of physicality for the players involved. RacingPanda, Northstar, JakeMR2 and 1 other person like this. I see that somebody let my conservative grandpa onto the forum. Granted, Jack is talking about it in terms of a greater picture, but speaking as someone who is of the young millennial age, I can see *why* it's popular: people of my age game. A lot. It's just a natural extension of interests. Companies see the popularity, and it's a gold rush to try and cash in on it. No different then any other rush. Look at racing games right now - polyphony decided that switching GT to a game that was more conducive to the eSports experience, something that iRacing has proved the validity of, was a good idea. Time will tell if it's a good idea on the whole (It certainly isn't if we are speaking of the core fan experience) but the returns are doing decent now. A lot of the popularity comes from Asia as well - where eSports has been the norm for years by this point. Really, it's just making the jump across the ocean now. It isn't. But to people of a certain age and ilk, as presented in this very thread and all over the internet, it strikes a fear that somehow, conventional sports will die off. They won't. They might get smaller, but leagues like the NFL and NBA will never die off. Er, uh... aren't we both currently trying our hand at an esport competition right now? EDK and Northstar like this. Yeah, at this point in time just about anything is being turned into a sponsored competition. I can't really say that competitive e-farming is any sillier than competitive ax throwing, horseshoes or blackjack... all of which I've seen on ESPN Sunday afternoons just this month alone. Yeah, at this point in time just about anything is being turned into a sponsored competition. Just for fun I decided to put this to the test and googled the least competitive thing I could think of, knitting! Just proves that television networks are getting ever more desperate to bring viewers back from Internet land, to the point that they're starting to rely on sheer novelty factor to generate interest. GT is a game. I'm with some others here. This E-Sports stuff is getting out of hand. I don't even want to know where the prize money is coming from. What do the sponsors actually get out of it? Its a industry that boomed out of no where in the last few years. Go back 10 years and people(friend, family, coworkers etc) though it was really strange that I went to another state for a PlayStation competition. That was the 1st AUS GT Academy by the way. They still find it strange now. I also race real cars. I will still say straight out, the simulation is nothing like the real thing. Much easier pressing buttons, then dealing with high heat, terrible vibrations, loud noises etc. I'm with some others here. This E-Sports stuff is getting out of hand. What I really don't get, is nobody has actually given any reasoning behind this attitude? Why is the fact E-Sports is becoming popular a bad thing? It's a hobby for most and the fact some people have been able to make a living doing something they genuinely enjoy is a good thing. Personally, I don't see the appeal either, but I don't see it triggering the fall of modern civilization like some seem to believe it is. I don't even want to know where the prize money is coming from. The game sells an insane number of copies, plus companies sponsor it. It's not like some shady organization is funding it. What do the sponsors actually get out of it? The same thing they get when they sponsor anything else, attention and hopefully some sales. They still find it strange now. People find all kinds of popular things to be strange, that doesn't mean they're bad. his E-Sports stuff is getting out of hand. What do you mean by "Out of hand" ? are there certain criteria to to determine that "oh ok this has gone too far enough"
I don't even want to know where the prize money is coming from. What do the sponsors actually get out of it? 1. The money comes from the game creators , sponsors and revenue from the events etc. Go back 10 years and people(friend, family, coworkers etc) though it was really strange that I went to another state for a PlayStation competition. By using the same kind of thinking before PS1 came out you were considered an antisocial loser if you liked gaming (and thats still going on to this day but far lees of course )fast forward 20+ years later and gaming has become more profitable than hollywood. virtual racing is something much more than just "pressing buttons"
Whats wrong with that ? there is a very high chance i may not be able to drive a real car once in my life but i love cars so i use racing games "to do" what i love why should that be seen as a negative?. I don't get the controversy. People like doing thing, some find it enjoyable to compete in thing and some even like watching competitions in thing. If thing has enough eyeballs companies will pay money to have these eyeballs see their name via sponsorship. Thing doesn't need to be a video game, though it happens to be one in this case. There are people that think snooker is boring, that football (soccer for the americans) is just pointless kicking of a ball around on a field and that video games is just pushing buttons. To the people that believe this has all "gone too far" or that it's somehow a sign of how we're failing as a society, I suggest you don't look down on something just because you may not like or understand it. It's ignorance at best and rude at worst. Northstar and George Jakob like this.